451 Marlborough is located on the north side of Marlborough, between Massachusetts Avenue and Charlesgate East, with 449 Marlborough to the east and 10 Charlesgate East to the west, across Alley 908. 451 Marlborough was designed by Hacin and Associates, architects, and built in 2015-2016 by the Holland Development Company, as a five-story, eight unit building. The building was built on what was originally four lots (451-457 Marlborough) with four townhouses built ca. 1887. They were demolished in 1967 and replaced by a one-story school building. On November 2, 2010, the school building was purchased by HD 407-411 LLC, formed by the Holland Development Company. In March of 2013, it received permission to demolish the existing building, and in August of 2013 it received approval to construct the new building. 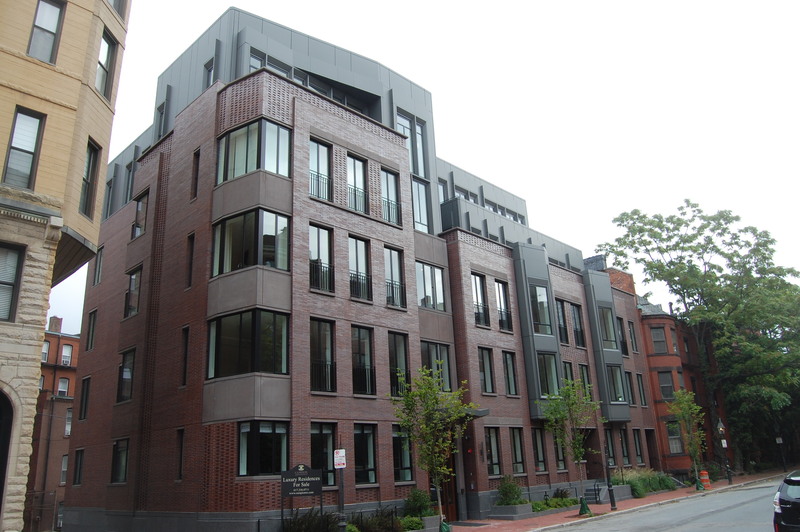 On September 20, 2013, HD 407-411 LLC transferred 451 Marlborough to the 451 Marlborough Street LLC (Joseph Holland, manager of record), and in June of 2016, the 451 Marlborough Street LLC converted 451 Marlborough into eight condominium units, the Four51 Marlborough Condominium. 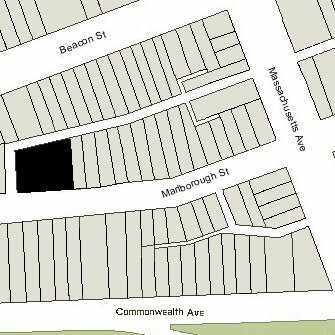 Click here for an index to the deeds for 451 Marlborough and its predecessor buildings at 451-457 Marlborough, and click here for further information on the land west of Massachusetts Avenue between the south side of Beacon and the north side of Commonwealth. 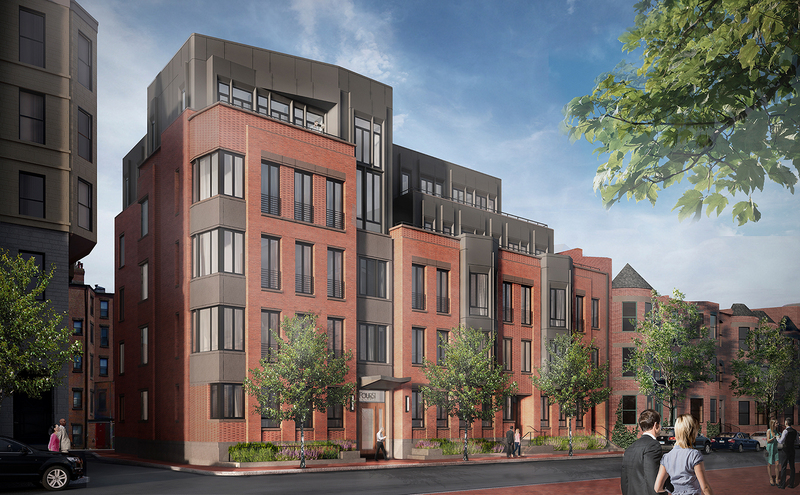 Architect’s design for 451 Marlborough, rendering by Tangram 3DS, courtesy of The Holland Companies and Hacin + Associates. The school building which 451 Marlborough replaced was built in 1967-1968 by Garland Junior College as an auditorium and classrooms (and later a cafeteria). Garland Junior College also owned 447 and 449 Marlborough, and its original proposal included 449 Marlborough as well well 451-457 Marlborough. 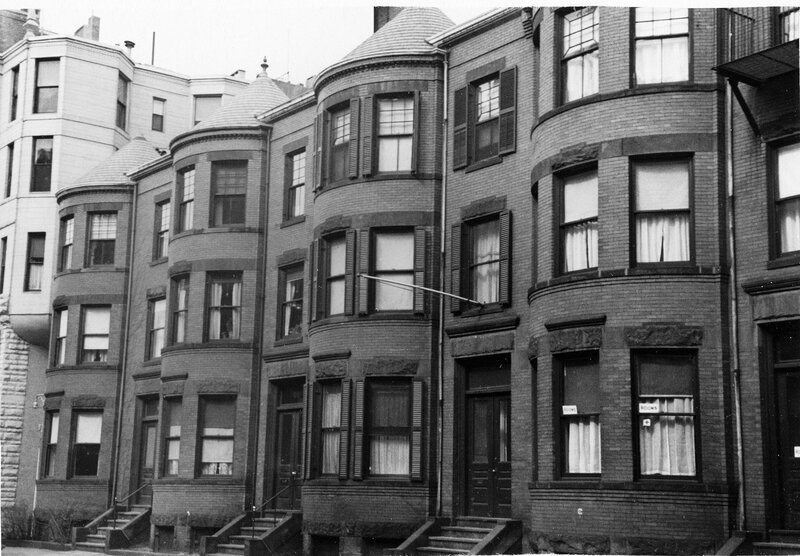 The project – including demolition of the five original townhouses – was presented at the first meeting of the Back Bay Architectural Commission on March 22, 1967. 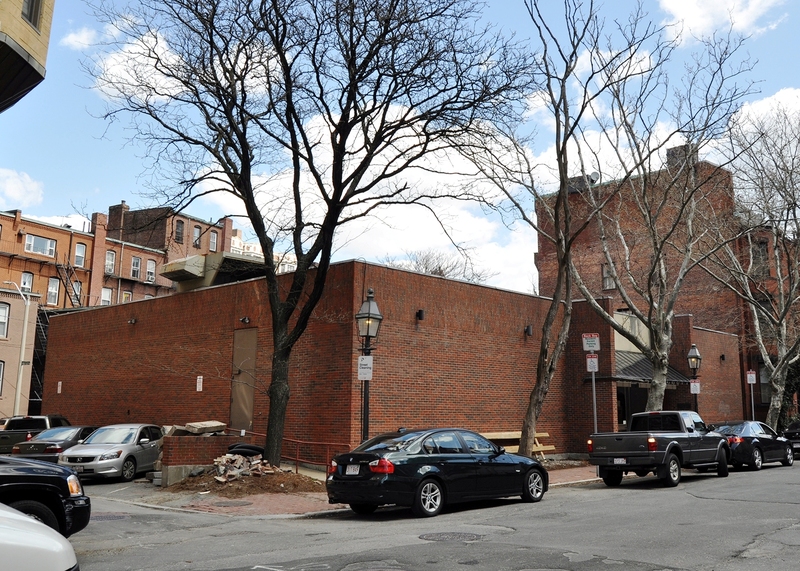 The proposed building, designed by architect Visvaldis Paukiulis, was described in the March 23, 1967, Boston Globe article on the hearing as “a windowless red brick structure.” It was subsequently approved by the Commission. The final building, however, only occupied 451-457 Marlborough; 449 Marlborough was not demolished and, instead, was used by Garland Junior College for offices. In the late 1960s, Garland Junior College owned a portfolio of 22 properties in the western portion of the Back Bay: 315, 319, 321, 329, 337, 339, 341, 343, 349, 377, 407, 409, 411, 413–415 Commonwealth, 24 Charlesgate East (419 Commonwealth), and 447, 449, and 451 Marlborough (composed of 451-457 Marlborough). In April of 1976, Garland Junior College announced that, because of financial difficulties, it was merging with Simmons College. It subsequently sold twelve of its properties: 315, 319, 321, 329, 337, 339, 341, 343, 349, and 377 Commonwealth and 447 and 449 Marlborough. The remainder of the properties – those located furthest west (407-415 Commonwealth, 24 Charlesgate East, and 451 Marlborough) – were transferred to Simmons College on October 21, 1977. Simmons College continued to use 451 Marlborough as a lecture hall and cafeteria. On June 20, 2005, Simmons College sold those buildings — 451 Marlborough, 407-415 Commonwealth, and 24 Charlesgate East — to Terra Green II LLC (formed by Terra Mark Development of New York and local partners). The proceeds from the sale were used to finance construction of the new school of management building. The College continued to occupy several of the Back Bay buildings until the new building was completed. On November 2, 2010, HD 407-411 LLC, formed by the Holland Development Company, purchased 451 Marlborough from Terra Green II LLC. It purchased 407, 409 and 411 Commonwealth at the same time. In March of 2013, Holland Development received permission to raze the existing school building at 451 Marlborough. The four houses originally located at 451-453-455-457 Marlborough, and which were razed by Garland Junior College in 1967, were designed by architect Obed F. Smith and built ca. 1887 for building contractor George Wheatland, Jr., for speculative sale. They were four of five contiguous houses (449-457 Marlborough) built in the same style. George Wheatland, Jr., is shown as the owner on the original building permit for 449 Marlborough, dated February 26, 1887 (the permit applications for 451-457 Marlborough are missing from the Building Department’s on-line files). George Wheatland, Jr., purchased the land for 449-457 Marlborough on January 8, 1887, from a real estate investment trust formed by Francis A. Palfrey, Francis A. Osborn, and Grenville T. W. Braman. It was part of a parcel the trust had purchased on June 1, 1880, from the Boston Water Power Company. On October 15, 1888, 451 Marlborough was purchased from George Wheatland, Jr., by Charles James Morrill, a shipping merchant in the East India and Mediterranean trade, and treasurer of the Provident Institution for Savings. He was unmarried and lived at 11 Arlington. 451 Marlborough became the home of Charles Morrill’s brother-in-law and sister, John Huntington Dane and Sarah Cecilia (Morrill) Dane. They previously had lived in an apartment at 46 Hereford. They also maintained a home on Burgess Point in Wareham. John Dane was president of the India Mutual Insurance Company, a marine insurance company. The company ceased operation in 1898 and he retired. Charles Morrill died in April of 1895. 451 Marlborough continued to be owned by a trust established under his will. Sarah Dane died in March of 1905. John H. Dane continued to live at 451 Marlborough until his death in July of 1908. 451 Marlborough was not listed in the 1909 Blue Book. By the 1909-1910 winter season, 451 Marlborough was the home of the Danes’ son, Dr. John Dane, and his wife, Eunice (Cooksey) Dane. They had married in August of 1909 and 451 Marlborough probably was their first home together. He was an orthopedic surgeon and previously had lived and maintained his office at 29 Marlborough. He continued to maintain his office there after moving to 451 Marlborough. They continued to live at 451 Marlborough during the 1910-1911 winter season, but moved thereafter to Jamaica Plain. On October 30, 1911, 451 Marlborough was purchased from the trust established under Charles Morrill’s will by Nathalie (Gourlie) Appleton, the wife of Francis Henry Appleton, Jr. He was a banker and later a trustee of estates. They previously had lived in an apartment at 259 Beacon. They also maintained a home in York Harbor, Maine. During the 1918-1919 winter season, Francis and Nathalie Appleton were living at 251 Marlborough with his father, General Francis Henry Appleton, whose second wife, Mary Spencer (Tappan) Appleton, had died in February of 1918. While the Appletons were at 251 Marlborough, 451 Marlborough was the home of Charles Taylor Lovering, Jr., and his wife, Ellen Brewer (Lyman) Lovering. Charles Lovering was a stockbroker and was serving in the US Army, including serving in France from June of 1918 to February of 1919. Their usual residence was at 9 Gloucester, which they had leased to others during the war period. They had resumed living at 9 Gloucester by the 1919-1920 season and Francis and Nathalie Appleton had resumed living at 451 Marlborough. The Appletons continued to live at 451 Marlborough during the 1932-1933 winter season, but moved thereafter to Brookline. 451 Marlborough was not listed in the 1934 and 1935 Blue Books. On September 13, 1935, 451 Marlborough was purchased from Nathalie Appleton by Richard Emerson Burton, a teacher. He was unmarried and his parents, Richard J. Burton and Louise Margaret (O’Connor) Burton, lived with him. Richard J. Burton was a stockbroker and later a real estate broker. They all previously had lived at 638 Beacon. Richard J. Burton died in July of 1941. By 1944, Richard E. Burton was serving in the US Army. He married in that year to Elizabeth Dantzen. Louise Burton continued to live at 451 Marlborough until her death in March of 1945. On March 23, 1945, 451 Marlborough was purchased from Richard Burton by Carl Samuel Dorr, a retired salesman, and his wife, Edith M. (Moulton) Dorr, who operated it as a lodging house. They previously had lived at 432 Marlborough. Carl Dorr died in 1952 and Edith Dorr moved soon thereafter. On May 3, 1954, 451 Marlborough was acquired from Edith Dorr by Henry H. Davis, an attorney, and his wife, Virginia Mildred (Nason) Lyons Davis. They also owned 449 and 455 Marlborough. The Davises lived in an apartment at 275 Beacon. In March of 1955, 449, 451, and 455 Marlborough were acquired from the Davises by Barnett Nathan Samuels and his wife, Bertha (Bessie) (Elkind) Samuels. They lived in Winthrop. In March of 1964, Garland Junior College acquired 449 and 451 Marlborough from Barnett and Bessie Samuels and 455 Marlborough from Barnett Samuels, Inc. In April of 1964, it acquired 447, 453, and 457 Marlborough. Garland Junior College subsequently razed 451-457 Marlborough and constructed a one-story school building in their place. On September 15, 1888, 453 Marlborough was purchased from George Wheatland, Jr., by Miss Annie Elizabeth Bursley, who lived there with her sister, Miss Caroline Wright Bursley. They operated a private school in the house. They previously had lived at 96 Chestnut and operated their school at 106 Chestnut. Annie and Caroline Bursley were daughters of Captain Ira Bursley of Barnstable. He went down with his ship, the Hottinguer, which was wrecked off the Irish Coast on January 14, 1850. By the mid-1890s, the Bursley sisters had ceased operating their school at 453 Marlborough. It continued to be their home. During the 1900-1901 winter season, they were living elsewhere and 453 Marlborough was the home of Arthur Marsh Merriam and his wife, Margaret Elizabeth (Coleman) Merriam. They previously had lived at 17 Hereford. They also maintained a home in West Manchester. By the 1901-1902 season, they had moved to 393 Marlborough and 453 Marlborough was once again Annie and Caroline Bursley’s home. During the 1903-1904 winter season they were traveling abroad and 453 Marlborough was the home of Richard Walden Hale, an attorney, and his wife, Mary Newbold (Patterson) Hale. They had married in May of 1903 and 453 Marlborough probably was their first home together. They also maintained a home in Dover, Massachusetts, which they made their year-round residence later in 1904. Annie and Caroline Bursley resumed living at 453 Marlborough during the 1904-1905 winter season. Annie Bursley died in 1905 and Caroline Bursley moved soon thereafter. On June 1, 1906, 451 Marlborough was purchased from Annie Bursley’s estate by Alice M. (Buswell) Towle, the wife of Dr. Harvey Parker Towle. They previously had lived in an apartment at 409 Marlborough. They also maintained a home in West Harwich. Harvey Towle was a physician and dermatologist. He maintained his office at 453 Marlborough. In 1935, the Towles were joined by their daughter, Alison (Towle) Umbsen, the widow of Gustave Henry Umbsen. She previously had lived in San Francisco, where her husband died in March of 1935. The Towles’ unmarried daughter, Elizabeth Towle, also lived with them. Harvey Towle died in October of 1937, and on October 7, 1937 (the date of his death), Alice Towle transferred 453 Marlborough to their daughter, Elizabeth. Alice Towle, Alison Umbsen, and Elizabeth Towle moved soon thereafter to Newton. 453 Marlborough was shown as vacant in the 1939 and 1940 City Directories. On May 15, 1940, 453 Marlborough was acquired from Elizabeth Towle by Joseph Luther Moulton, a real estate broker, He and his wife, Alice W. (Hopkinson) Moulton, an artist, made it their home. They previously had lived in Newton. They had moved by 1942. By 1942, 453 Marlborough was the home of Mrs. Edna Mae (Reynolds) Candage Lovejoy Walsh. She was the former wife of Henry (Harry) Wells Candage, and the widow of Everett John Lovejoy and Dr. William Martin Walsh. She operated 453 Marlborough as lodging house. She previously had lived at 57 Westland. In 1942, she married to Wallace Edwin Grant. They divorced soon thereafter. She continued to live at 453 Marlborough until about 1944, when she moved to 164 Bay State Road. Edna Grant subsequently purchased a number of Back Bay properties that she operated as apartments or lodging houses. On November 22/23, 1945, a series of deeds were recorded transferring 453 Marlborough from Joseph Moulton to Alonzo Donald Reed (dated November 3, 1945), from Alonzo Donald Reed to Edna Maye [sic] Walsh (dated May 23, 1941), and from Edna Maye Grant to Francis (Frank) Greene MacCausland (dated November 20, 1945). At the time the deeds were recorded, both Edna Grant and Frank MacCausland lived in Stoneham. They later both lived in Reading. In April of 1948, Edna Grant acquired 470 Beacon, where she moved from Reading. Frank MacCausland moved there with her as a lodger. On August 12, 1946, 453 Marlborough was acquired from Frank MacCausland by Victor D. Ruotolo and his wife, Mary J. Ruotolo. On the same day, they transferred the property to Josephine (Cuoco) D’Amore, the former wife of Santo D’Amore, who operated it as a lodging house. She lived at 74 Salem and was treasurer of the Taormina Restaurant at 76 Salem. By 1948, she had moved to 509 Beacon. On January 25, 1950, 453 Marlborough was acquired from Josephine D’Amore by real estate dealer Frederick E. Ordway. He converted the property into five furnished apartments, which he advertised for rent on June 1, 1950, the Boston Globe. On December 16, 1950, 453 Marlborough was acquired from Frederick Ordway by John McLaren. He and his wife, Edith McLaren, lived in one of the apartments. On July 10, 1952, 453 Marlborough was acquired from John McLaren by Evelyn A. (O’Leary) Harrison, the widow of Frank M. Harrison, who lived in one of the apartments. She previously had lived in an apartment at 25 Marlborough and, before that, in Salem, Massachusetts. She continued to live at 453 Marlborough until about 1958, but moved thereafter, probably back to Salem, where she was living in 1960. On December 17, 1958, 453 Marlborough was acquired from Evelyn Harrison by Stratford William Carter, a technical illustrator and salesman, who lived in one of the apartments at 453 Marlborough. He previously had lived in an apartment at 351 Beacon. Also living at 453 Marlborough was Edward J. McGrath, who also previously had lived at 351 Beacon. He was employed with Pistorino & Co., freight forwarders. In August of 1961, Stratford Carter acquired 293 Marlborough. On December 19, 1962, Edward McGrath acquired a one-half undivided interest in 293 Marlborough and 453 Marlborough from Stratford Carter, and on February 5, 1963, he acquired the other half interest in both properties from him. Stratford Carter and Edward McGrath continued to live at 453 Marlborough until about 1964. By 1965, Edward McGrath had moved to an apartment at 293 Marlborough and Stratford Carter had moved to Marshfield. On April 2, 1964, 453 Marlborough was acquired from Edward McGrath by Garland Junior College. That same month, it also acquired 447 and 457 Marlborough; during the previous month, it had acquired 449, 451, and 455 Marlborough. On April 30, 1888, 455 Marlborough was purchased from George Wheatland, Jr., by Ellen Sears (Amory) Anderson, the wife of John Francis Anderson. They lived at 185 Beacon. John Anderson had served in the Civil War as an aide-de-camp to General John G. Foster, and at the end of the war was brevetted a Brigadier General. He subsequently became a dry goods merchant in Boston. 455 Marlborough became the home of the Andersons’ son-in-law and daughter, Francis Stanley Parker and Harriet Amory (Anderson) Parker, who married in December of 1888. He was a wholesale coal dealer. In 1893, John and Ellen Anderson separated. He moved to Portland, Maine, and she moved to 455 Marlborough to live with the Parkers. On October 3, 1893, she transferred 455 Marlborough to her brother, Charles Walter Amory, as trustee on her behalf. The Parkers continued to live at 455 Marlborough during the 1893-1894 winter season, after which they moved to Bedford. By the 1908-1909 season, they had moved to The Chesterfield at 371 Commonwealth, and in February of 1911, they purchased and subsequently moved to 391 Commonwealth. Ellen Anderson continued to live at 455 Marlborough during the 1895-1896 season, after which she moved to 391 Commonwealth. She died May of 1908. 455 Marlborough was not listed in the 1897 Blue Book. On March 25, 1897, 455 Marlborough was purchased from Charles Amory by Hannah M. (Tirrell) Clark, the wife of Cyrus Turner Clark, a painting and decorating contractor. They previously had lived in an apartment at 421 Marlborough. Cyrus Clark died in March of 1899. Hannah Clark continued to live at 455 Marlborough with their younger children, Arthur Tirrell Clark and Helen M. Clark. Their older son, David Oakes Clark, lived in Hingham with his wife, Fanny W. (Bassett) Clark. David Clark was treasurer of Cyrus Clark’s painting and decorating company; Arthur Clark was president and also was treasurer of the Tenney Manufacturing company, confectioners. Helen Clark married in May of 1905 to William Atkinson Nye. After their marriage, they lived at 455 Marlborough with her mother and brother. William Nye was employed with the Old Colony Trust Company. On November 6, 1909, Hannah Clark transferred 455 Marlborough to Helen Nye. Hannah Clark died in 1917. Arthur Clark and the Nyes continued to live at 455 Marlborough. Arthur Clark died in March of 1923. William and Helen Nye continued to live at 455 Marlborough until his death in October of 1952. Helen Nye moved soon thereafter. On February 28, 1953, 455 Marlborough was acquired from Helen Nye by Beverly Mercier, a legal secretary in the offices of Isadore J. Silverman, who conveyed it on March 10, 1953, to Henry H. Davis, an attorney, and his wife, Virginia Mildred (Nason) Lyons Davis. In September of 1953 they acquired 449 Marlborough and in May of 1954 they acquired 451 Marlborough. The Davises lived in an apartment at 275 Beacon. In March of 1955, 449, 451, and 455 Marlborough were acquired from the Davises by Barnett Nathan Samuels and his wife, Bertha (Bessie) (Elkind) Samuels. They lived in Winthrop. On December 30, 1957, they transferred 455 Marlborough to Barnett N. Samuels, Inc. In March of 1964, Garland Junior College acquired 449 and 451 Marlborough from Barnett and Bessie Samuels and 455 Marlborough from Barnett N. Samuels, Inc. In April of 1953, it acquired 447, 453, and 457 Marlborough. On February 24, 1888, 457 Marlborough was purchased from George Wheatland, Jr., by Sarah E. (Fisk) White, the wife of Dr. Elisha Mann White. They had married earlier that month and 457 Marlborough was their first home together. Elisha White previously had lived at 7 Forest, where his first wife, Amelia (Hopkins) White, died in May of 1885. Elisha White was a physician and surgeon. He was affiliated with his brother’s firm, Charles W. White & Company, dealers in trusses, supporters, and other surgical supplies. Elisha White died in July of 1890 in Yellowstone Park. Sarah White moved soon thereafter but continued to own 457 Marlborough and lease it to others. By the 1890-1891 winter season, 457 Marlborough was the home of Hayward Pierce Hall and his wife, Sarah B. D. (Bates) Hall. The previously had lived at the Hotel Cluny at 543 (233) Boylston. Hayward Hall had owned and operated Orchard Farm in Burke, Wisconsin, from the late 1850s until the 1870s. By 1880, they had moved to Boston, where he became a coal merchant and later a real estate dealer. He died in June of 1892 and Sarah Hall moved thereafter. 457 Marlborough was not listed in the 1893 Blue Book. By the 1893-1894 winter season, 457 Marlborough was the home of attorney Charles Neave and his wife, Elizabeth (Farraday) Neave. They continued to live there during the 1894-1895 season, but moved thereafter to New York City. By the 1895-1896 winter season, 457 Marlborough was the home of Dr. William Thomas Councilman and his wife, Isabella (Coolidge) Councilman. They previously had lived in an apartment at 224 Marlborough following their marriage in December of 1894. William Councilman was a professor of pathology at Harvard Medical School. They continued to live at 457 Marlborough during the 1897-1898 winter season, but moved thereafter to 78 Bay State Road. 457 Marlborough was not listed in the 1899 and 1900 Blue Books. By the 1900-1901 winter season, 457 Marlborough was the home of George Howland Stoddard and his wife, Eoline (Sheffield) Stoddard. They previously had lived at the Hotel Berkeley (southeast corner of Berkeley and Boylston) and in Hamilton. The Stoddards continued to live at 457 Marlborough during the 1902-1903 winter season, after which they moved to 197 Beacon. 457 Marlborough was not listed in the 1904 and 1905 Blue Books. On December 16, 1904, 457 Marlborough was acquired from Sarah White by Miss Teresa McCamlie. The property changed hands and on May 15, 1905, was acquired by Elsie Brewster (Howe) Taylor, the wife of Dr. Edward Wyllys Taylor. They previously had lived in an apartment at 416 Marlborough. They also maintained a home in Ipswich. Edward Taylor was a physician and professor of neurology at Harvard Medical School. He maintained his office at 457 Marlborough until about 1920, when he moved it to 527 Beacon. He continued to maintain his office there until about 1926, when he moved it back to 457 Marlborough. By 1918, they had been joined by Miss Mary Reed Howe, Elsie (Howe) Taylor’s first cousin (Elsie Taylor’s father, William Wirt Howe, was the brother of Mary Howe’s father, Albert R. Howe). During the 1922-1923 winter season the Taylors (and probably Miss Howe) were abroad and 457 Marlborough was the home of John Osborne Sumner, a professor of history at MIT, and his wife, Margaret Paulding Sumner. They previously had lived at The Charlesgate at 535 Beacon. The Taylors had resumed living at 457 Marlborough by the 1923-1924 winter season. Charles Taylor died in August of 1932. Elsie Taylor continued to live at 457 Marlborough with their unmarried daughter, Katherine Brewster Taylor, and her cousin, Mary Howe. By 1936, Mrs. Taylor had begun to accept lodgers, and by 1937 she had moved to Cambridge. Katherine Taylor and Mary Howe moved with her. On August 13, 1936, 457 Marlborough was purchased from Elsie Taylor by Katherine (Van Tine) Durell, the wife of Albert Benjamin Durell. Living with them were their son and daughter-in-law, Van Albert Durell and Margery (Hart) Durell. They all previously had lived in Brookline. Albert and Van Durell were business brokers in the firm of Durell & Durell. They continued to live at 457 Marlborough in 1939, but had moved to 452 Park Drive by 1940. On July 7, 1939, the Massachusetts Hospital Life Insurance Company foreclosed on a mortgage given by the Durrells and took possession of the property. On April 30, 1940, 457 Marlborough was purchased from Massachusetts Hospital Life Insurance by Corinne (La Brecque) Campagna-Pinto, the widow of Leonardo Campagna-Pinto. She converted the property into a multiple dwelling, either a lodging house or apartments. Corinne Campagna-Pinto was a teacher of foreign languages at Beaver Country Day School. She lived at 457 Marlborough with her son, Dante Francesco Campagna Pinto, a student who later would become a physician in San Francisco. They previously had lived in Cambridge. By 1941, she had been joined at 457 Marlborough by Samuel Thal and his wife, Jeanette (Eyre) Thal. They previously had lived at 115 Berkeley. Samuel Thal was an artist, etcher, and architectural sculptor, and Jeanette Eyre Thal was an author and Russian expert. They moved to Cambridge the next year and then to 354 Marlborough by 1944. Corinne Campagna-Pinto continued to live at 457 Marlborough until about 1947, when she moved to 254 Commonwealth. In about 1953, she moved back to 457 Marlborough. On October 5, 1954, she transferred the property into her and her son, Dante’s, names. She continued to live at 457 Marlborough until about 1957, when she moved back to 254 Commonwealth. 457 Marlborough remained a multiple dwelling, either a lodging house or apartments, in the early 1960s. On August 8, 19562, 457 Marlborough was acquired from Corinne Campagna-Pinto and Dante Campagna-Pinto by Jack Aifer. On April 2, 1964, 457 Marlborough was acquired from Jack Aifer by Garland Junior College. That same month, it also acquired 447 and 453 Marlborough; during the previous month, it had acquired 449, 451, and 455 Marlborough.